Bishan Residential Development Pte Ltd - JV between CapitaLand 65% and Mitsubishi Estate Asia 25% and Shimizu Corporation 10%. 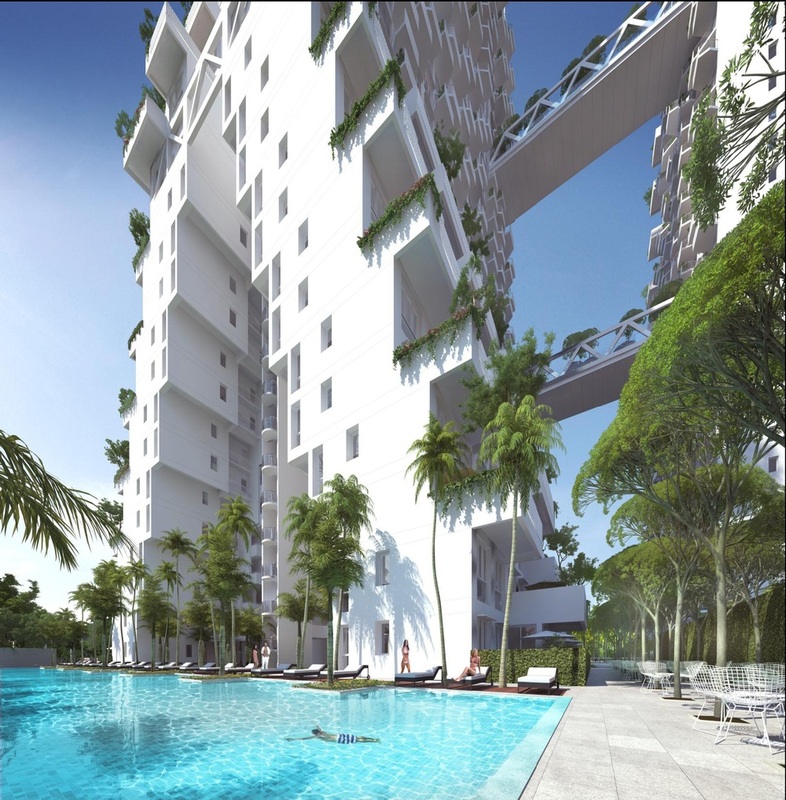 In its design for Sky Habitat, Moshe Safdie the architect has broken with tradition. He introduced in its state, a strong and distinctive step-like form structure, at once bold, unique and distinctly different. 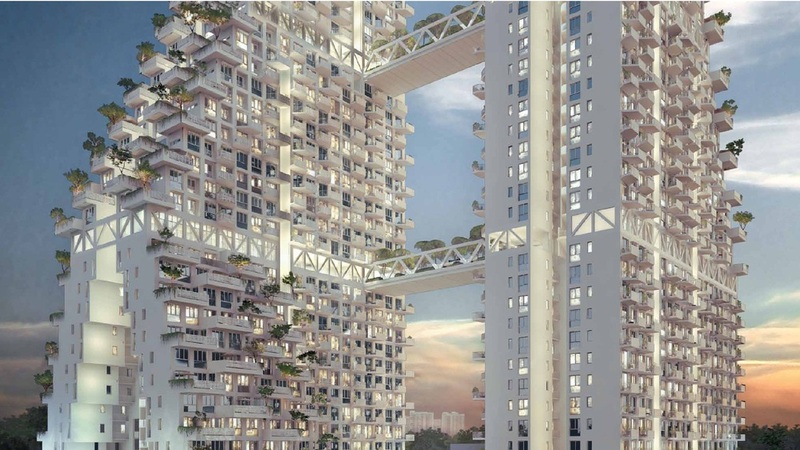 Sky Habitat by CapitaLand unfolds like a floral petal into a 3D-matrix of homes, private terraces and public gardens. 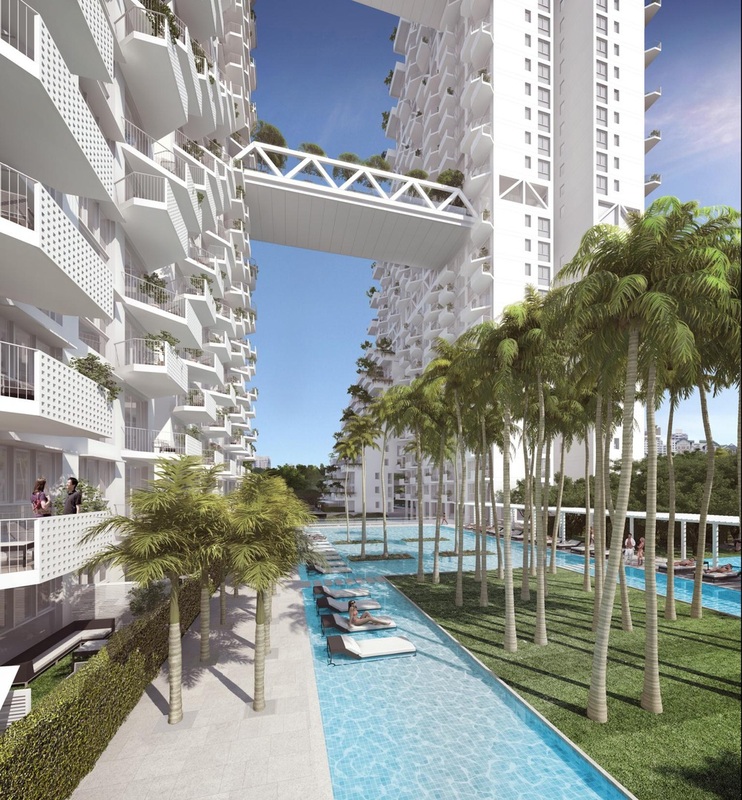 The two independent towers in Sky Habitat is linked by three bridging ‘sky gardens’ to impress residents, visitors and guests alike. Another well thought out feature is the allocation of 70% of its site to the development of a series of lush garden landscapes, out-door events rooms, swimming pools and walk paths for residents enjoyment. These communal gardens and leisure spaces lead to opportunities for more interaction among CapitaLand's Sky Habitat occupants. There will be breathtaking views of Bishan Park, with its sculptured landscapes and ponds, from the windows of your towering Sky Habitat apartments. The structure of Sky Habitat is highly rationalized to cater to cross ventilation and multiple exposures to every unit. Sky Habitat is engineered to allow air to breeze through and sunlight to penetrate, to dispel stagnant air and reduce humidity. The interior of Sky Habitat layouts and living spaces is designed to make it highly livable, to address the need for space and to help meet home-buyers needs. Sky Habitat is a 99 year leasehold property. It has two 38-storey towers and 509 residential units. The site area for Sky Habitat is 129,135.7 sq ft.
Sky Habitat units range from 1 bedroom + study, 2, 3, and 4 bedrooms to simplex and duplex penthouses. The floor area starts from 635 sq ft for a 1 bedroom + study to 3638 sq ft for penthouses. Moshe Safdie, is the chief designer of Sky Habitat. Moshe Safdie, the Israeli / Canadian architect, wears many hats. He is also an urban designer, educator, theorist, and author all rolled in one. His illustrious Habitat 67 architectural work singled him out for international stardom. Marina Bay Sands integrated resort in Singapore, is also another of his accomplished creation. Bishan previously known as Peck San Theng was once a Cantonese burial ground set up by Chinese immigrants in 1870. The popularity of Bishan lies in the academic schools within its vicinity. You will find many great schools here. Many parents have been known to relocate their residences to within 1 km radius of popular primary schools, just so that their children gets to enjoy the first priority of admission into these elite foundations of learning. Sky Habitat Condo allows you the added advantage of living close to such elite and noteworthy schools in and around Bishan. Raffles Institution (RI), founded by Sir Stamford Raffles on 5 June 1823 is the oldest school in Singapore. Initially named Singapore Institution, Raffles Institution's original campus was on Bras Basah Road where Raffles City Shopping Centre now stands. Raffles Institution has a tradition of being one of the top schools in Singapore, if not the top. Entry qualifications to gain admission are stringent. It is every parents' dream to have their kids enroll in the school. Perhaps that explains why Bishan is ever so popular. Catholic High School is another elite school for the academic student. In 2005, Raffles Junior College became the first junior college to be awarded the School Excellence Award (SEA) in Singapore. Ai Tong School is considered one of Singapore's most popular primary school. As a Chinese-medium school, Ai Tong emphasizes strongly on the learning of Chinese culture, language and values. MOE Language Centre and ITE College Central. The presence of elite and outstanding schools have made Bishan the property hot spot for parents with school going children. Bishan's Junction 8 shopping centre is a stone throw away from Sky Habitat. Junction 8 derived its name from the number assigned to Bishan Station (N8) on the North South Line. Anchor tenants in the mall includes Golden Village movie theatre operator, Fair Price Finest, Best Denki and Popular Bookstore. If going to Junction 8 once too often makes you bored, there are alternative malls further afield like Thomson Plaza, Ang Mo Kio Hub and Nex mega mall. There you will find a wider array of retail outlets, eateries and shops. Whether you are buying on impulse, window shopping or scouting for your next 'to do' list, there will be no lack of choices. If you have the means, you will have your way. Sky Habitat or habitat in the sky, you decide. One thing is for sure. It will remain conspicuously different and visually conspicuous, for a long time to come. Sky Habitat has achieved iconic status for Singapore's Top 3 Outstanding Projects in 2013 under the following categories: Star Architects | Iconic Landmarks | Signature Developments. Guard House | Entry Court | Lily Ponds | Water Wall | Pool Island | BBQ / Party Lawn | Tennis Viewing Garden | BBQ Social Areas | Children's Play Area | Reflection Gardens | Tennis Court | Leisure Pool | children's Pool | 50 Metre Lap Pool | contemplative Gardens | Outdoor Exercise Space with Pool Showers | Pedestrian Gate to Bus Stop. 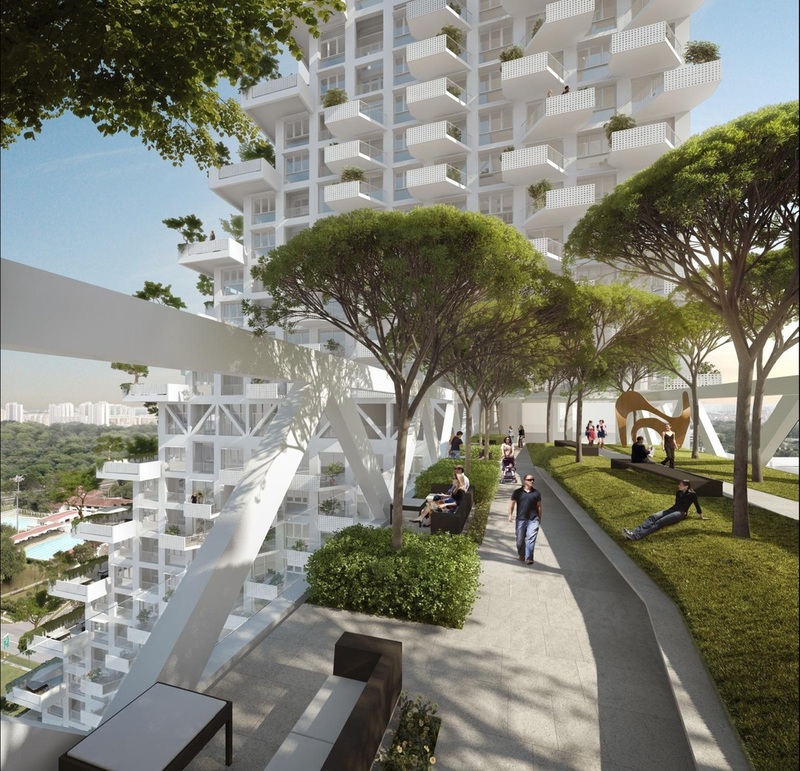 CAPITALAND is pricing its new condo project SKY Vue in Bishan lower than its earlier next-door Sky Habitat at launch. For Sky Vue, the developer’s strategy is to not only churn out smaller units, but also a higher proportion of smaller units, to keep absolute prices within reach of a bigger pool of buyers. The two 99-year leasehold projects are plotted side by side and near Bishan MRT Station. Here is a blow by blow illustration between the ‘Porsche’ class of SKY HABITAT and the mass condo type of SKY VUE. Tenure: Both Sky Habitat and Sky Vue have 99 yrs tenure. Location: Both condos are located in Bishan St 15 and their land sites adjoin one another. Developer: Both condo projects are developed by CapitaLand. CapitaLand said yesterday it will offer the first phase of Sky Vue units in the project at prices ranging from $1,380-$1,550 psf. 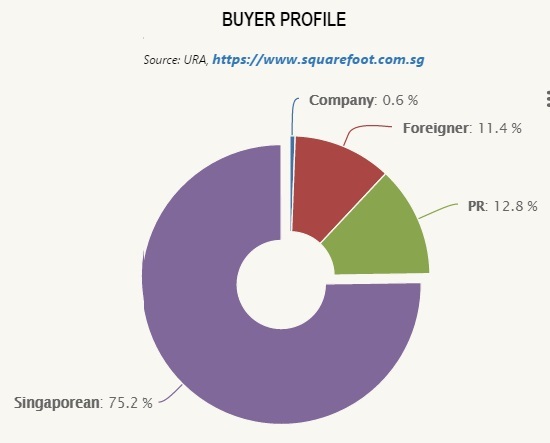 According to Urban Redevelopment Authority (URA) data: Sales at Sky Habitat began in April 2012, with 131 units sold by the developer in that month, at a median price of $1,583 psf, and with prices ranging from $1,435 psf to $1,893 psf in April. From October 2012 to July 2013, 40 units were sold at prices ranging from $1,416 to $1,810 psf. CapitaLand said yesterday that to date, it has sold 172 units at Sky Habitat at an average price of $1,589 psf. CapitaLand the developer has gone for smaller units in the new project Sky Vue, to stay abreast of market changes. The smallest unit in the Sky Vue development is 484 sq ft for a one-bedder against 635 sq ft for Sky Habitat, for a one-bedroom with study. Two-bedders in the new project start from 678 sq ft, compared with 721 sq ft in Sky Habitat. 74 per cent of Sky Vue's 694 units is made up of 1- and 2-bedders (including two-bedroom suites). Sky Habitat's 1- and 2-bedders (including two-bedroom + study units) account for only 42 per cent of the total 509 units. Sky Vue is being developed by a 75:25 joint venture between CapitaLand and Mitsubishi Estate Asia. The two have respective stakes of 65 per cent and 25 per cent in Sky Habitat, with Shimizu Corporation holding the balance 10 per cent. CapitaLand bagged the Sky Habitat site at $869.36 per square foot per plot ratio (psf ppr) in February 2011 and Sky Vue's next-door plot at $852.94 psf ppr in a tender that closed in November 2012. CapitaLand Limited is the result of a merger between DBS Land, a subsidiary of DBS Bank and Pidemco Land, a subsidiary of ST Property Investments. It was formed on November 2000 and is headquarted in Capital Tower which opened in May 2001. Some recent projects by CapitaLand are Bedok Residences, d'Leedon, Latitude, The Interlace, The Nassim, The Orchard Residences, The Seafront on Meyer, The Wharf Residence and Urban Resort Condominium.